Ronson Gears introduces the new Fellows FS630-200 CNC Hydrostroke Internal Gear Shaper, which brings a new level of internal gear cutting capability to Australia. The new gear shaper machine can cut internal gears up to 650mm in diameter, external gears to 635mm diameter with up to 200mm face width. The hydrostroke system provides rapid stroking return ratios up to 4:1 for optimum production and efficiency. The rigid construction and hydromechanical stroking enables cutting forces concentric to the cutter spindle, resulting in minimum power loss and optimum cutting stroke accuracy. From one-offs to production batches that ensure globally competitive prices. Quality results, via state-of-the-art CNC equipment and highly-skilled staff. Quality grades to AGMA14 / DIN 3 or better. Adherence to the latest industry standards in the gear manufacturing industry, as accredited members of AGMA and Eurotrans. CNC gear measuring and inspection service, to verify accuracy and provide piece of mind. 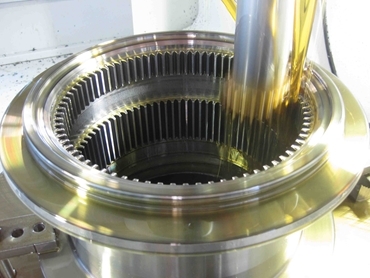 CNC gear cutting, gear grinding and gear shaping service. “This new technology is capable of producing gears with far superior tooth profile accuracy and surface finishes compared to older shaping machines, leading to longer gear life,” he said, “This is important to our customers supplying to the Mining, Construction, Agriculture, and Aerospace industries”. An added advantage for customers is that part quality levels of DIN 5 (AGMA 11) are being achieved and can be certified on Ronson’s CNC Gear Measuring Machine. “It’s our commitment to our customers to deliver world class service and the purchase of the Fellows Gear Shaping Machine secures our position as Australia’s leading gear manufacturer with the most advanced gear cutting capability,” Mr New said.